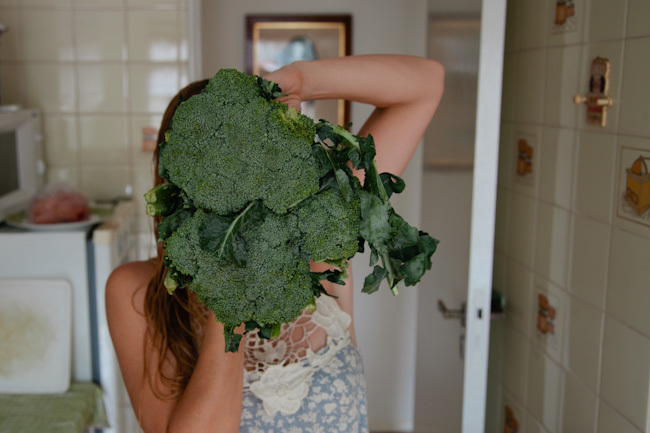 One Gigantic Broccoli | .liveit.loveit.blogit. Last week, the hubs picked up a gigantic broccoli at our local Saturday fruit and veg market. Apparently, when he asked the woman for a broccoli that was ‘más pequeño’ (smaller) she just smiled at him and shook her head no. He’s got no idea whether something was lost in translation or whether she just thought it was hilarious to send him packing with a gigantic broccoli, but in any event we knew we would be cooking with broccoli. A lot. Luckily, in a random coincidence that make me smile, that same day this post popped up in my Pinterest. Basically, a gazillion different broccoli recipes for me take some inspiration. 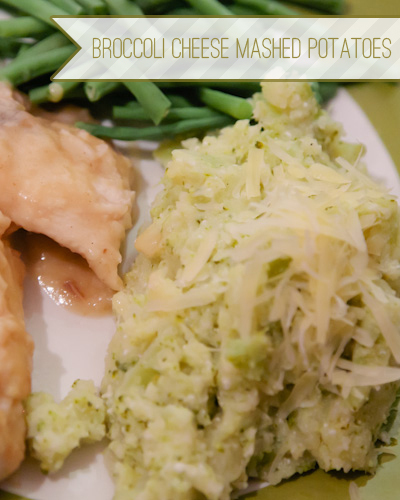 So, our first broccoli dish last week: Broccoli & Cheese Mashed Potatoes (inspired by these Asigao Mashed Potatoes and Broccoli) Make these. They are delicious – and the rave reviews from the hubs and from my mom ensured them a spot in my recipe book for years to come! Boil potatoes and broccoli together for about 20 minutes, until soft. Drain and return to pot. Add all remaining ingredients, reserving enough parmesan for garnish, mash until smooth. Garnish with reserved parmesan and serve. 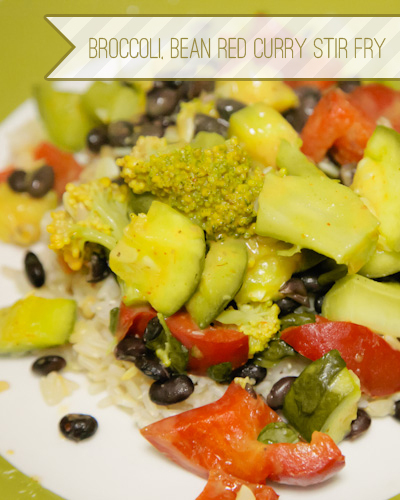 Our second broccoli recipe was also seriously awesome. 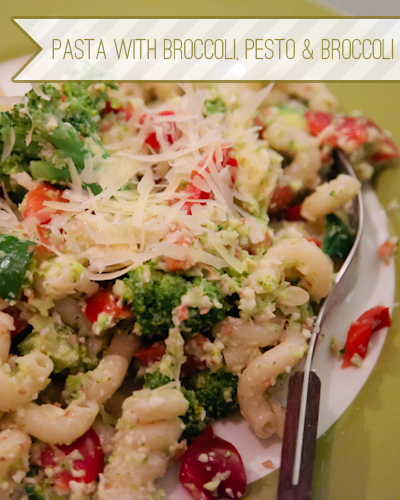 Pasta (any kind, I recommend super fun cellentani/corkscrew pasta) with Broccoli Pesto and Broccoli. This time, inspired from here. This may have been my favourite of all three broccoli dishes. Ever since I first started making homemade pestos about 2 years ago, I just can’t get enough. And this was my first broccoli pesto ever. In a large pot of boiling water, boil broccoli until tender and bright green. Transfer 2 /3 of the broccoli to a blender or food processor with a slotted spoon, and reserve the remaining broccoli (be sure to remove it from the pot, so it does not continue to cook). Return water to a boil and cook pasta according to package directions. Drain pasta and return to pot. Meanwhile, add oil, parmesan, nuts and garlic to blender/food processor and puree until smooth. Sauté red peppers, summer squash and reserved broccoli in a small frying pan. Add pesto and sautéed vegetables to pot, mix and serve. (Sprinkle with parm, if desired). Our third, and final broccoli recipe in the week of so much broccoli was a red curry stir fry with black beans, broccoli, summer squash and red pepper. This one was kind of disappointing (the red curry paste we picked up in Chinatown smelled amazing while cooking, but tasted only ok). If you have a red curry paste you love (whether homemade or store bought) this would be awesome. Cook rice according to package directions or these awesome instructions. Meanwhile heat olive oil in a wok. Once hot – but not smoking – add red curry paste and mix. Add in black beans and sauté (if using dried beans, see instructions here). Add coconut milk, and vegetables to the wok. Add broccoli, stir fry for about 2 minutes, add red peppers, stir fry for an additional 2 minutes, add summer squash, stir fry until all vegetables are crisp. Serve over rice. And there you have it. Our week of broccoli. Jenny on Onward to Madrid!